The possibilities of the internet are changing our lives and the world of business profoundly. However skilled experts who can help companies move into the digital age are currently hard to find. The Business Networking eBusiness programme(WNB) provides the key qualifications necessary to enable companies and other organizations to compete successfully in the future and to move into new areas of business. Can you picture yourself using your openness, empathy, curiosity and creativity to work in a team on projects where, for example, you develop and implement new ebusiness business ideas which don't yet exist? Do you want to do a broad-based degree programme which allows you to work in many different areas and where you can find out what your personal interest is, then develop it further? Our T-shaped programme starts with a broad basis (the cross stroke of the T) then allows you to specialize (the downstroke of the T). The Business Networking eBusiness (WNB) programme first gives you a broad foundation and then enables you to focus with electives on the areas which interest you. Is the whole WNB degree programme women-only? The lectures in the mandatory subjects are only for WNB students. Later in the electives and the two semester projects - Business Project and Software Project in the 5th and 6th semesters - you will study together with other bachelor's students. This gives you the advantages of both types of learning, unique in Germany. And the success of our graduates shows that it works. How user-friendly is a website and how can we test it? Students learn the criteria of what a good website should look like, design their own prototypes based on these and afterwards carry out usability tests. Virtual reality will increasingly be used in the future, and not just for games. In the MCI - Man-Computer-Interaction course, the various possibilities of virtual reality will be tested. Who studies WNB - Business Networking eBusiness? Prerequisite for the course is the university entrance qualification. The individual circumstances of applicants vary widely, e.g. Currently ebusiness is one of the largest growth markets in the world and the end is not yet in sight. The Business Networking eBusiness programme combines the specialization of ebusiness with web-and media design, business studies, computer science and soft skills. Webshops and apps among many other things belong to our everyday life and new ideas and developments are just waiting to be thought up and implemented. Do you want to be part of this and develop your own app in a WNB course? 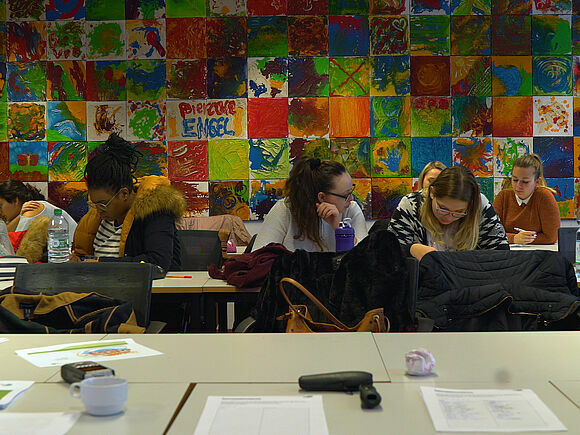 The WNB programme combines eBusiness with Web and Media Design, Business Studies, Computer Science and social skills, to be able to shape and implement the digitalization of business creatively. The combination of subject knowledge, methodology and soft skills, as well as the balance of theory and practice in the curriculum enables our graduates to work successfully in the global economy. The programme content is practice-oriented and, of course, continually adapted to changes in technology and business so that we always offer up-to-the-minute courses. Students gain workplace experience during the integrated internship semester which is broadened in other projects carried out in cooperation with companies during both the foundation and advanced studies. The Business Networking eBusiness programme aims to teach the fundamentals of business information systems in 3 semesters by focusing on eBusiness in the areas of business studies, computer science and soft skills. In the 4th semester (internship semester) students put their theoretical knowledge into practice (e.g. in industrial companies or consulting companies) and start to work on their own areas of interest in which they would like to specialize in the 5th and 6th semesters at the University in electives and/or in a semester abroad. The final assignment (thesis) is normally written in a company. Under Programme Structure below you will find a detailed description of all lectures (modules). Click on the module to see the module description. Under Learning Outcomes you can see what you will gain from the modules.